« Move on Brogrammers, your comments aren’t welcome anywhere. Back in the good old days (the late 1990s) you didn’t need to worry about things like NUMA unless you were running the top 0.001% of workloads. Today however even a fairly small server can have multiple NUMA nodes. NUMA configurations aren’t just for physical SQL Servers either. Virtual Machines can have NUMA configurations as well (typically called vNUMA). There’s a few different ways of figuring out how many NUMA nodes you have in your server. If you are logged onto the server via RDP or on the physical console you can find this just by opening task manager. 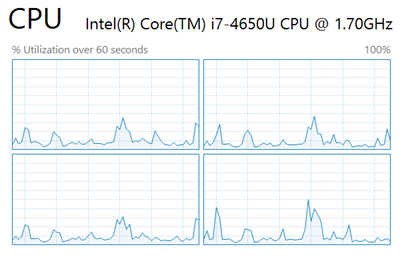 Once task manager is open go to the Performance tab (if it isn’t visible select the “More Details” button at the bottom) and select the CPU graph. You should see a graph on the right. Right click on that graph and select “Change graph to”, then you should see a NUMA node option. If the NUMA node option is greyed out, then you have one NUMA node. If it isn’t greyed out then select the option and however many graphs you see is how many NUMA nodes you have. It should look something like this. The second option is to use SQL Server Management Studio. Connect to the server using the object explorer. Right click on the instance in the object explorer and select the CPU tab. Expand the “ALL” option. However many NUMA nodes are shown is the number of NUMA nodes that you have as shown below. You can even expand each NUMA nodes to see which logical processors are in each NUMA node. For each NUMA node there is in the server there will be a line in the ERRORLOG file. The CPUs which are in the NUMA node are shown based on the values in the CPU mask and the Active CPU mask. In this case the server has a single NUMA node with 8 cores in the NUMA node. How do we get a value of 000000ff for 8? This is hex, so the first core is 1, the second core is 2, the third core if 4 and the fourth code is 8. Add those up and you get 15. Because we’re dealing with hex, we count 1 through 9, then to get beyond 9 we use letters. A is 10, B is 11, C is 12, D is 13, E if 14 and F is 15 (yes F is supposed to equal 16 but if we start counting at 1 and skip 0 it works, so work with me; all you need to remember is that F means 4 CPUs). In almost all deployments the number of CPUs will be some multiple of 4 so you’ll end up with either 0s or Fs. If there’s other values in there that might be ok, or it might not. More digging will be required. You can also use T-SQL (or performance monitor) to see how many NUMA nodes there are. By looking at the sys.dm_os_performance_counters DMV you can see how many NUMA nodes SQL sees. The query below will give you the exact number. For every row it returns there will be one NUMA node. How many NUMA nodes is too many? Like most questions, that’s a pretty loaded question. If you have more than 4 then odds are something is configured incorrectly. If you have more than 8 I can pretty much guarantee that something in configured incorrectly. If you have one or two, that’s probably OK. The general rule of thumb that I tell people is that if you have more than 2 it needs to be reviews because it’s probably wrong. The most that I’ve seen is 16 NUMA nodes on a box, and that starts going some REALLY strange things. But more on that on another day. For now, let’s just be happy that we know how many NUMA nodes are too many, and how to figure out how many we have.